Posted on July 7, 2012 by Becki M.
You are probably thinking two things. 2. If I’m talking about the photo above…where is the zucchini? Ah, you don’t, do you? And neither did The Littles. In fact, Jackson only knew it was there because he helped shred it. By the time the dish was in front of his face, he had completely forgotten about it. Would you like to know how to stuff 2 pounds of a healthy vegetable into your kid’s bodies without them catching on? Or, if they do catch on, the dish is so delicious that they don’t care? Follow along, friend. I’m about to rock your world. And your nutritional intake. So, I was inspired by a recipe from the Food Networks magazine, July/August edition. It’s called Broken Lasagna with Zucchini-Tomato Sauce. I followed their recipe almost to a T, but I changed a few things. First, I didn’t use broken lasagna pieces. 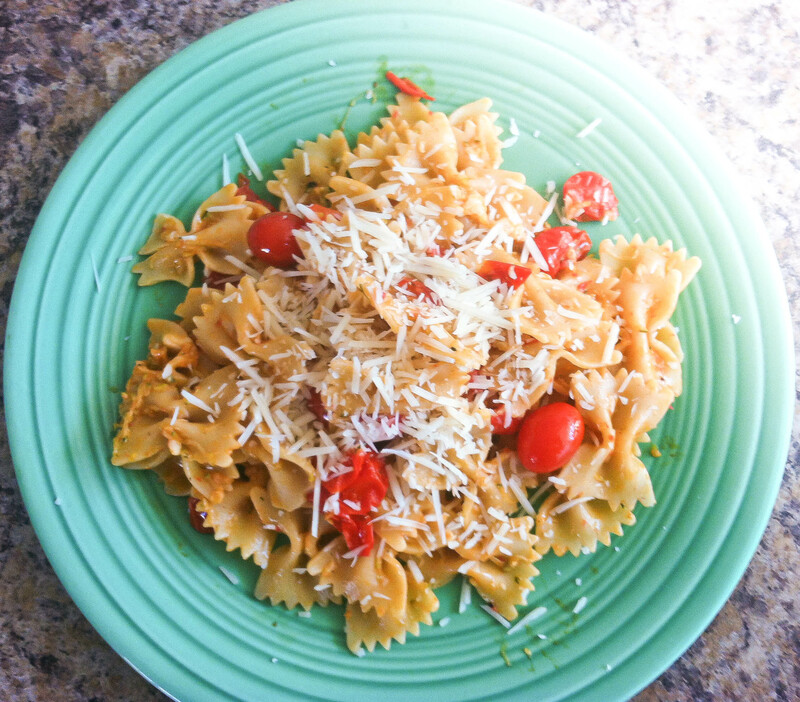 I used bow tie pasta. I was just lazy and didn’t want to take the extra step to break noodles, although that would be a fun job for the kiddos. Also, the recipe calls to “coarsely grate” the zucchini, which means that you see it. I really didn’t intend to hide the vegetable; my shredder was just fine, so it grated it super fine. This is how you pack all that in without them seeing it. The trick? FINELY grate the zucchini. There is no “sauce” in this recipe; the zucchini/tomato mixture is what gives the noodles their flavor. It’s awesome. So, here is the recipe. Try it. It’s great. And minus the 3 TBS of butter, its pretty good for you! 1. Boil your noodles. While they are cooking, shred your zucc’s on a paper towel to collect all the moisture. Give a gentle squeeze to drain your pile of healthy. Grate some lemon zest. 2. Heat the butter, add the cherry tomatoes and cook until blistered and softened. Add the zucchini/lemon zest to the pan. Crush your tomatoes with a wooden spoon, add some salt and pepper to taste, and cook for about 5 minutes. 3. Transfer the mixture to a large bowl and add the pasta and cheese. Stir it all together and serve! The Littles gobbled it up, and Brooklyn even asked for seconds! It really was delicious! Enjoy!